A few weeks ago my mentee was getting ready to go to college on the other side of the country (she’s there now), so we got together for one last meeting that we wanted to make special. Danni picked the Guggenheim since she’d never been there, and I think it was a good choice since it’s such a unique New York landmark designed by the tempestuous Frank Lloyd Wright. 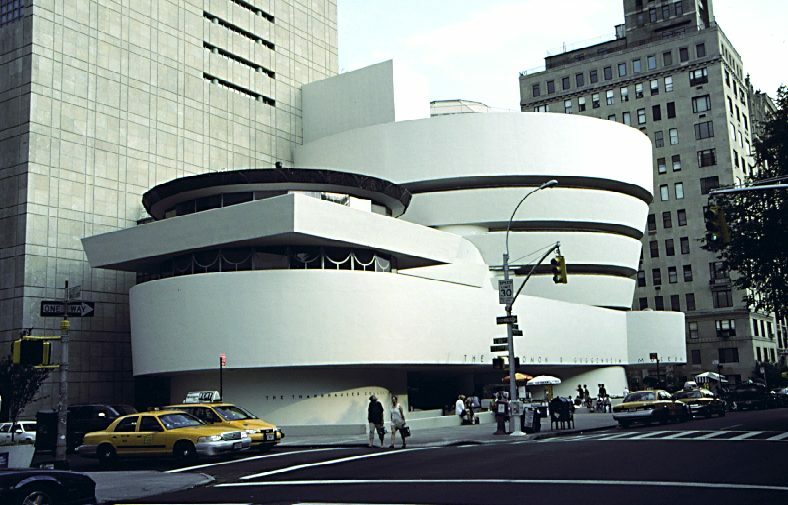 Though she’d never been to the Guggenheim, she recognized it from a chase scene in Men in Black. That’s how distinctive the building is. The last time I had been to the museum was for a lecture by Alexei Ratmansky that was part of the Guggenheim Works & Process series. The lecture was in a weird part of the building that I couldn’t find. I circled the building and came upon the front door where a red carpet event was going on. A couple posed on the carpet, which looked shiny and cheap to me, and went into the building. There was minimal paparazzi, but it still seemed like too much to me. I thought it was a little fancy for a lecture but tried to put some iron in my spine as I walked up to the door. My photo was not taken. Instead, the doorman asked if I was kitchen staff, in which case I needed to use a different entrance. I told him I was there for the lecture series and found out that I was supposed to be on the other side of the building. As I walked over, I could see people through the glassed-in dining room of the museum; they were all tuxed and glammed out for what looked to be a donor dinner or something like that. I was feeling much more comfortable this time at the Guggenheim, waiting out front for my mentee in the sunshine, listening to all of the languages around me. A tourist family from the South approached the museum. The kids and mother charged ahead while the father stayed behind studying the museum’s sign advertising the admission fees. “Wait now,” he said. “It costs twenty-two dollars to get in here.” Then he realized he was speaking to nobody. Danni arrived and we got in line for our tickets. I had to get the full-priced admission, but with Danni going off to college, we were able to get her a reduced student rate after she answered a few questions (“What college are you going to?” and “What’s your major?”). We hadn’t paid attention to what exhibits were going on when we decided on the Guggenheim, and now we studied the signs and both agreed that we wanted to see the Rineke Dijkstra photography exhibit. We both really love photography, and our last art session had been the Cindy Sherman exhibit at MOMA so it seemed like we were coming full circle by seeing another exhibit by a female photographer. We started with a series that Dijkstra had done with subjects in parks. There were enormous photos (all of her work is big) of children in Berlin’s Tiergarten, where I had been just a year ago. I tried to see if I could recognize anything, though I had only been to the Tiergarten twice and Dijkstra’s series had been filmed an entire decade before those visits. Some of the photos were obviously of siblings, and Danni told me how seeing pictures of little girls together creeped her out. It reminded her too much of the dead ghost girls in The Shining. I found myself more preoccupied with the fashions the kids were wearing and trying to decide if they dated the pictures or not—is glitter nail polish always in style? In this part of the exhibit, we also saw the self-portrait of Dijkstra, which is supposed to be a crystallizing point in her career. Dijkstra had been working as a freelance photographer when she had a bike accident, breaking her hip. She had to undergo intense physical therapy, which involved swimming, after being bedridden for five months. She ended up taking this self-portrait after she was physically exhausted from doing thirty laps in a swimming pool. At this point, she became interested in photographing subjects right after they had experienced intense physical exertion. This led to series of swimmers along various beaches, mothers who had just given birth (one so fresh that blood is seen running down her leg in the photograph), and bullfighters in torn and bloody clothes. There were a few rooms tucked away where videos made by Dijkstra were being shown on a loop. In the first room, we saw a red-haired girl who was being filmed as she drew from a Picasso artwork that the audience is unable to see. Instead, we get to observe the way that this girl, Ruth, observes Picasso. Trippy, but not nearly as amusing as the videos that Dijkstra took of teens dancing at the Buzz Club and Krazyhouse. She films these subjects alone against a white background, so it’s just the teenager and the camera. When the music comes on, they dance, according to their particular style. A girl with a shaved head is very intense, her arms held out stiffly in front of her, moving them as she tried to catch the beat. When she can’t quite get it, she cracks a smile, but when she has it, she lets it rip. My favorite was the last dance video we saw before we left the Guggenheim. A heavy metal boy flails, lip-synchs, and headbangs in perfect synchronicity to the music. A lot of practice in front of the mirror was required for that performance. Danni knows about my heavy metal teen years and asked if I headbanged like that. I did, but I told her I was graceless compared to this kid. Plus, it gave me a headache.